Summit's Board of County Commissioners declined to grant approval to Vail Resorts and development partner Gorman & Co. on the proposed Village at Wintergreen workforce-housing project at a public meeting Tuesday afternoon. The three-member board (from left to right in this file photo) Dan Gibbs, Thomas Davidson and Karn Stiegelmeier, instead called for a special meeting on May 16 to come to a final decision. SUMMIT COUNTY — Summit County on Tuesday entered into last-ditch negotiations with Vail Resorts, Inc., and its development partner on an employee-housing proposal in Keystone. However, the clock is ticking. If an agreement isn’t reached soon, the project could be dead in the water. The formal request for the 196-unit Village at Wintergreen was first presented for county consideration this past November following word of a new pact aligning Vail and residential construction firm Gorman & Company on the Vail-owned property earlier in the year. The deal stated Gorman would build and manage the housing complex on the north side of U.S. Highway 6 between Keystone and Dillon in exchange for a yearly lease of about $35,000. After months of discussion, bargaining and postponements, the applicant and the county’s executive board and staff each acknowledged Tuesday they are closer to an agreement. Attempting to address both public and county concerns, Gorman adjusted the proposal to include a pedestrian connector it will build and maintain and confirmed fulfillment of the required child care facility for 80 kids on the site, and Vail committed to hosting a multi-stop shuttle on that stretch of the road. However, the two sides have still not been able to iron out final details, and they might now be up against the clock. As submitted, the project consists of 120 year-round one- and two-bedroom units, 36 three-bedroom seasonal units, and approximately 40 primarily one-bedroom low-income units. The 28.4-acre parcel, produced by combining three smaller tracts of land, is zoned for as many as 243 units, and Gorman estimates Wintergreen would be suitable for as many as 500 occupants. One of the major obstacles for the developer is that low-income units involve federal tax credits and the application deadline for those is fast approaching on June 1. The next chance to apply is the same cutoff the following year, but with so many variables in the economy, including construction and commodity costs, on top of interest rate volatility, Gorman has no assurances the project’s figures in 2018 will still make sense for the firm or potential creditors who would lend them the money. Nonetheless, the plea for urgency did not force the county’s hand Tuesday. Upon the nudging of county manager Scott Vargo, the three-member Board of County Commissioners yet again approved a motion for a continuance, this time for a single week to a special hearing May 16. Vargo believed that if the parties could sit down together just once more, they could decide definitively if a compromise could be brokered. A main sticking point for the county commissioners revolves around the affordability of the market-rate rentals, because the low-income units would already stipulate pricing in line with 60 percent of the area median income. The developer argues that just to acquire the financing, it needs a cap of twice that rate, though the commissioners refused to budge. Crangle said Gorman does not intend to rent at $1,800 a month for a one-bedroom and nearly $2,200 for two, because it’s not what the market will bear. Instead, they’re working off about 90 percent AMI, or no more than $1,400 for a single bedroom and $1,900 for two, each with annual increases of 2 percent. Who can live in the properties is another hang-up. The guiding document for Keystone under the county’s control dictates it must be exclusively individuals who work in the Snake River Basin. To ensure units remain consistently occupied, Vail and Gorman are instead asking that a priority-leasing program be adopted. That would grant first dibs to employees of the resort and surrounding area, but after 10 days it shifts to the entire valley from Swan Mountain Road to the top of Loveland Pass at the county boundary. After 10 days more, the unit would be open to anyone in the county. For its part, Keystone Resort wants to receive credit for everyone housed at Wintergreen no matter where in the county the person may work. The area’s guiding document includes a condition that Keystone must offset future construction on the resort with employee housing credits. But without that guarantee, the resort said, it is not confident, long term, it will be able to hit the mandatory employee-housing requirement with the hotel and other services it hopes to build in the future. “We are not willing to put the housing credits at risk,” said Mike Goar, Keystone Resort’s vice president and COO. “We cannot go down that road. I just can’t stress that enough. 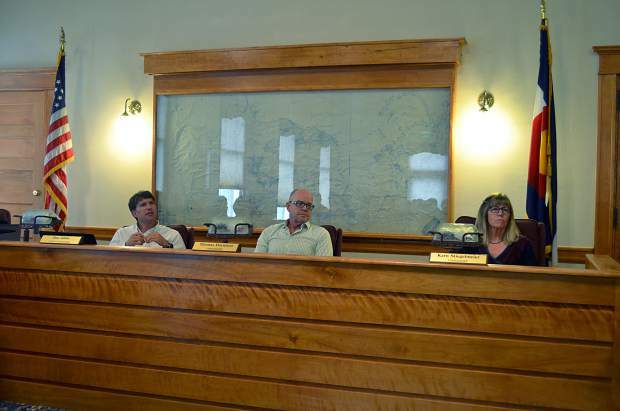 The commissioners seemed to share the sentiment, but were also unmoved by emotion, still wanting to ensure the ski resort fulfills its obligations to the letter of that guiding document for the basin.